These ants are completely black instead of two-toned. The black carpenter ant does damage to sound, undamaged wood. They don’t eat wood, but they hollow out “galleries” in wood for nesting that are so smooth they appear to be finished by sandpaper. They normally nest in dead portions of trees, stumps or logs and invade homes in search of food. They feed on living or dead insects and nearly all sweets or meats inside and outside of the home. They will often be found in homes around windows, doors, decks and gutters. All of these areas may have wood softened by water, which makes it more attractive to these pests. The odorous house ant is quickly becoming the most common ant to infest homes in our area. 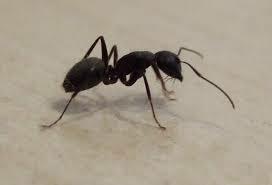 They are similar in size, shape and color to pavement ants and will readily nest indoors. The easiest way to identify them is when they are crushed: They give off an odor like coconut or citronella. These ants will have larger nests, and since they easily live indoors, they may be harder to control. Their preferred meal is honeydew produced from aphids, but they will readily eat sweets and protein of all types. These are the most common ants in the Mid-west. They are generally black and most often will nest outdoors coming into homes and businesses only to forage for food. They will feed on almost anything, including meats, sugar and bread. Many times, a single ant will be seen only to be followed by many more. This forager will go back to the nest and bring others to the food source that was found inside the home. These small red-to-yellowish ants can be found trailing anywhere within a structure. They can nest in wall voids, cabinets, boxes of food and any other accessible crevices and spaces. They are known to invade sick rooms and feed on blood plasma and wound dressings. Their colonies have multiple queens and can split into small groups, spreading very rapidly. In subtropical areas, Pharaoh Ants readily nest outside in leaf debris found on or near structures. Re-invasion of the structure can occur during warm periods. These ants should not be sprayed with insecticides. This will cause a budding of nests to occur, which causes ants cut off from the colony to start a new colony elsewhere in the home or building. For more information about ant control click here. 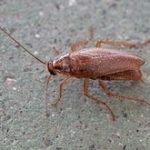 This pest which gets its name from the trees it infests is more a problem for homeowners based on its overwintering habits. 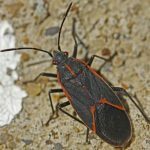 Box elder bugs like several other pests will try to come inside during colder months to stay warm and hibernate through the winter. Typically they will enter on the south or west sides of a home, and often are attracted to light colored houses. Once inside they are pretty docile, and pose no threat. As spring approaches and the weather warms they will try to get out, with some inadvertently coming inside instead. Exclusion along with regular exterior treatments is the best prevention for these pests. A Centipede’s color varies and depends on the species, but most are brown to orange-brown with many body segments. 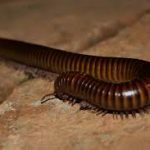 Unlike Millipedes, Centipedes have only one pair of legs per segment. 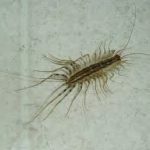 They usually live outdoors in dark, moist areas and are seldom seen inside homes, except for the house Centipede, which is identified by its extremely long legs. The house Centipede is usually found where dampness occurs. They are nocturnal, and when disturbed, they move swiftly towards dark hiding places. These pests, which are plant feeders, show preferences for bluegrass and fescue lawns. It has also been shown that they prefer lawns which are well fertilized and watered. Clover mites thrive in the spring and fall, are not too fond of the summer heat and usually hibernate from June until September. They will often enter a home or business around windows and doors and often congregate around walls with a brick exterior. If found inside you should not touch them. Although they won’t sting or bite, they crush very easily which may cause staining on walls, drapes, or carpet. Try a vacuum with a hose attachment to pick them up. The American Cockroach is the largest of the house cockroaches. Hospitals and warehouses are also targets. It has reddish brown wings and is a good flyer. American Cockroaches often invade from sewer systems and heavily mulched areas. Grocery packages are also a favorite transport. The female attaches the egg capsule, containing about 12 eggs, in high areas in garages, closets, utility rooms and fireplaces. The young mature at 12 months. Found nearly anywhere in the house, American Cockroaches contaminate food, carry disease, damage book bindings, fabrics and wallpaper. This house cockroach, with two dark brown vertical stripes behind the head, is found throughout the world, thriving wherever man lives, eating the same foods, sharing the same habitats. It is commonly found in restaurants, kitchens, and stores where food, moisture and harborage are abundant. German roaches are rarely seen outdoors. Populations build rapidly from egg capsules being produced about every 20 to 25 days. Each capsule contains 30 to 35 eggs. The young mature in four to six months. 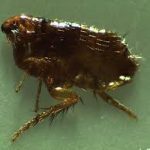 German roaches contaminate food, leave stains, create foul odors and carry disease organisms. They hide during the day, closely packed in small cracks and crevices near food and water. 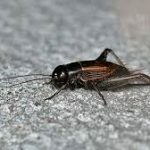 The tan House Cricket can be found in warm, damp, dark places, such as shrubs, grass, basements or crawl spaces. Active mostly at night, they will eat almost anything they can chew from rugs to drapes, and they usually enter a building from harborage right outside. Their common song is a triple chirp. Their courtship song is a continuous trill. Earwigs were named by a superstition that the insect would crawl into people’s ears when they are asleep. More easily recognized by its forceps-like tail appendage, the Earwig is a major garden pest as well as an annoying household pest. It is one of the few insects that takes care of its young. 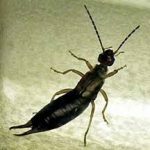 Earwigs feed on green plants and other vegetation and do little damage indoors. The pinch of their forceps is neither painful nor poisonous but does an effective scare job. House fleas are small, hard-bodied, wingless insects with a flattened body and legs adapted for jumping on to a host. The cat flea, most commonly encountered in Florida, seeds mammals for the blood meal needed to sustain them. They can be a direct health hazard, transmitting disease and tapeworm. Humans are often attacked when other food sources aren’t available. Their bite leaves a red, itchy spot on the skin. Their saliva is irritating to the host, causing dermatitis and hair loss in allergic animals. 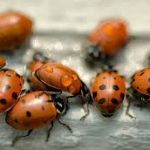 Ladybugs are generally beneficial insects. 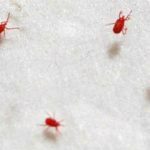 Originally bred to combat aphids and scale insects, these pests have a certain knack for nuisance when they spend the winter inside homes and businesses. They enter buildings in the fall to escape the coming cold of winter. They are most often attracted to light-colored walls and will usually appear on the south and west walls that typically face the sun during the winter. Once inside, they will huddle inside walls and basements until the outside warms up again and signals their escape. The problem is they don’t have a good sense of direction, and instead of returning outside, they may enter your home again by mistake. The best control inside is a vacuum cleaner to remove the pests. Spraying inside walls is not effective. Brownish and worm-like in appearance with many body segments, Millipedes have two pairs of legs on each segment. They typically live outside in moist vegetation, leaf litter and mulch and feed on decaying organic wood and plant matter. When conditions are right, migrations can occur, and large numbers will find their way inside homes through cracks and crevices. When disturbed, they curl up like a watch spring. These slender, wingless insects are common in homes. 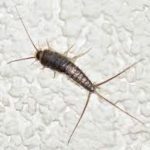 The Silverfish are covered with shiny and silver or pearl-gray scales with three long tail-like appendages and two threadlike antennae. The scales help them escape the grip of ants and spiders. Silverfish cause damage by eating foods, cloth or other items high in protein, sugar or starch. They eat cereals, moist wheat flour, paper on which there is glue or paste, book bindings, wallpaper, starch in clothes and linens. They will breed in bookcases, storage boxes and linen closets. Oval white eggs are dropped in a few places week after week. Eggs hatch in two to eight weeks with adulthood reached in about two years. They thrive in moist hot areas from the attic to the crawl space. The Black Widow is glossy black with a red hourglass marking on the underside of its abdomen. The female is much larger and more distinctly marked than the male. It makes a strong, sticky irregular web in protected areas where prey is likely to wander in and be trapped. Foundations, vents, shrubs, outside seats, trash and woodpiles at ground level are common habitats. Their poisonous venom can cause concern for small children and older or sickly persons. Medical attention should be sought if bitten. 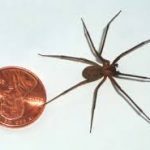 The brown recluse is a brownish spider with a distinctive violin-shaped mark behind its eyes, which has earned it the name “fiddle-backed” spider. It is found in undisturbed areas such as sheds, garages and dark closets. Garments left hanging, coats and shoes are favorite spots. Their bite causes a severe systemic reaction that develops a crust and a surrounding red zone. The crust falls off, leaving a deep crater, which may take several months to heal. The crater may require extensive medical attention. Springtails, sometimes referred to as sand fleas, are often just an outdoor nuisance. They get their name from the fact that they have a small springlike appendage on their underside that allows them to hop in the air if disturbed. They will usually infest damp areas around a home, such as mulch beds. Since springtails are so small, the moisture in their environment controls their actions. After a rain, these pests will often be more prevalent as there is less chance of dehydrating. If there is little or no rain, they may look to new environments, such as your home, for shelter. 2019 © | Green T Pest Control - Content Cannot Be Used Without The Expressed Written Consent of Green T.